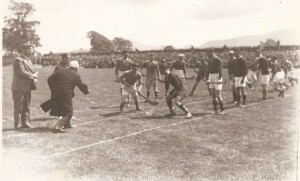 Tipperary v Kilkenny – 1916 to 2016: Part 3. 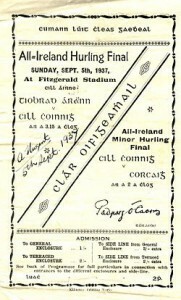 Killarney, a Munster Final in October, and 1945. 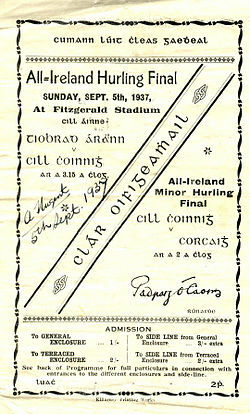 After the 1922 All-Ireland final, Tipperary and Kilkenny did not meet again in a championship match until the final of 1937. This game was played in Killarney, the first final played outside Croke Park since 1909. Croke Park was unusable because the construction of the new Cusack Stand was way behind schedule due to a builders' strike. At home in old Ireland or over the sea. Who conquered Kilkenny in Killarney's fair town." The old rivals might well have met again in the 1941 final, had not fate intervened in the form of foot-and-mouth disease which was particularly prevalent in the two counties. Kilkenny were reckoned to be the favourites to win the All-Ireland. They were due to play Dublin in the Leinster final, but were barred from travelling by the Department of Agriculture. Consequently, Dublin were nominated to represent Leinster and they went on to defeat Galway in the All-Ireland semi-final. In Munster, Tipperary were about to play Cork in the provincial semi-final, with the winners to meet Limerick in the Munster final. Again the Department intervened and forbade Tipperary to travel. Cork then played Limerick to select the team to represent Munster. Cork easily defeated the reigning All-Ireland champions in this match. 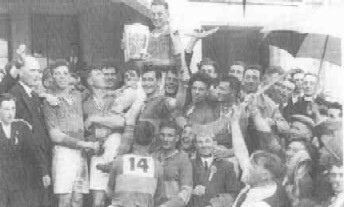 In the delayed All-Ireland final, played on September 28, Cork crushed Dublin by 5-11 to 0-6 in one of the most one-sided finals of all time. Cork were the champions having played just two games. In the 1941 provincial deciders which were played later in the year, Dublin beat Kilkenny by 2-8 to 1-8 in November, and Tipperary defeated Cork by 5-4 to 2-5 in October. Boherlahan-Dualla had three players on that Tipperary panel: Jimmy Maher, in goal, and Jer Looby, at no. 15, both played against Cork, but Philly O'Dwyer was sidelined with a serious knee injury. Cork drove on to complete their famous four-in-a-row of titles after that year. These finals were quite one-sided with margins of 20 points in 1941, 7 points in 1942, 27 points in 1943, and 14 points in 1944. Former Taoiseach, Jack Lynch, played a leading part in each of those Cork victories. 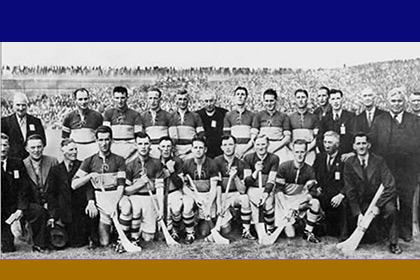 The next encounter between Tipperary and Kilkenny was in the first post-WW2 decider in 1945. Tipperary had ended Cork's four year reign on 1 July in Thurles. A record crowd of 69,459 came to see the final on 2 September, and they were treated to one of the best games in years. 'The kings of hurling reign again'." Back l-r: Jack Mockler, Jer Cornally, John Maher, H. Goldsborough, Tom Wall, Rev. John Meagher, Flor Coffey, Jim Devitt, John Coffey, A. Brennan, Johnny Ryan, Jim Maher, Dan Breen T.D., Bill Leahy. Front l-r: J.J. Callanan, Phil Purcell, Tommy Butler, Mike Murphy, P. "Sweeper" Ryan, Jimmy Maher, Tommy Doyle (Captain), M. Ryan, T. Purcell, E. Gleeson, Johnny Leahy, T Semple. Coming in Part 4: Three-In-A-Row, and 1958.